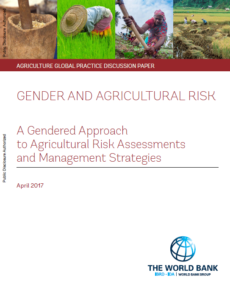 The World Bank Agriculture Global Practice announced the launch of a Discussion Paper focused on integrating the gender dimension into agricultural sector risk assessment (ASRA) practices. Differences in social, cultural, geographic, and economic contexts at the country level call for a tailored approach that takes into account the unique combination of risks, cultural differences, institutional arrangements, and fiscal constraints present. The World Bank has gathered significant experience and lessons learned from conducting ASRAs around the world for over ten years, and acknowledges that a gender based approach to agricultural risk management (ARM) will strengthen resilience of rural farming households facing exogenous agricultural shocks. In 2015, the World Bank came out with the paper titled “Agricultural Sector Risk Assessment: Methodological Guidance for Practitioners”. This comprehensive blueprint document laid out steps to assess risks and develop risk management solutions for agricultural risk management and development practitioners. While the document remains valuable, the gender dimension was a critical missing puzzle piece. This new discussion paper explicitly addresses the gender dimension, and complements the current operational ARM framework and toolkit applied by the World Bank and other agencies. The application of a new, gender-based framework laid out within the paper will assist in focusing agricultural risk management interventions and leading to stronger resilience of agricultural systems. This paper is intended to be used alongside the “Agricultural Sector Risk Assessment: Methodological Guidance for Practitioners” publication. The objective of this paper is to develop an approach for integrating a gender dimension into Agricultural Sector Risk Assessments (ASRAs). The focus is on the approach because both agricultural risk and gender issues are contextual, thus the outcomes of a gender-based risk assessment are highly dependent on the social, cultural, geo-graphic, and economic contexts of the setting in which the assessment is applied. The organization of the paper reflects the challenges of incorporating a gender dimension into ASRAs. The conceptual framework and step-by-step illustrations presented herein are based on lessons learned by the World Bank and other institutions in assisting developing economies in conducting sector and key commodity supply chain risk assessments (World Bank 2015a). The paper also relies on recent work by international institutions and academic research that offer insights into the complexities of gender issues in relation to agricultural shocks. These experiences inform this paper’s case for a gender-based approach to Agriculture Risk Management (ARM) and help to illustrate a practical, stepwise approach for conducting gender-based ASRAs. This paper is arranged as follows: Chapter 2 offers a summary of the conceptual framework for risk management, including addressing why a gendered approach to ASRAs is essential; Chapter 3 shows the available evidence that agricultural risk has a gender-differentiated impact on farming households and that farming households adopt a gender-differentiated response to risk; Chapter 4 describes a step-by-step operational approach for doing so, and includes guidance for formulating gender-smart policies and strategies for strengthening agricultural systems’ resilience; and Chapter 5 presents a summary of findings and concluding remarks. In occasion of the launch iof the paper co-author Carlos Arce joined by discussants Åsa Giertz, Senior Agriculture Economist, and Sanna-Liisa Taivalmaa, Senior Gender Specialist, from the World Bank met on a Webinar on May 18th to discuss the findings, recommendations, and lessons. Carlos works as a development economist with over thirty years of experience addressing issues related to agricultural policy and risk management in developing countries. In the past, he has worked for various international agencies like the Free University of Amsterdam, the Canadian International Development Agency, the Netherlands Ministry of Foreign Affairs, and the World Bank. Lately, after retiring from the World Bank, he works as a consultant advising on agricultural policy and risk management. He holds degrees in law and economics. Åsa is a Senior Agriculture Economist in the World Bank’s Agriculture Global Practice, where she for little over three years has been part of the Agriculture Risk Management Team. She currently leads agriculture risk management, agricultural development, and nutrition-sensitive agriculture work, in particularly in Africa. Åsa has worked with agriculture development for over 12 years, for the World Bank and the UN Food and Agriculture Organization, and has experience from Africa, Europe, Latin America, and Central and South Asia. She holds a MSc in Economics from Stockholm University and a MSc in Food and Nutrition Policy from City, University of London. Sanna-Liisa serves as the Senior Gender Specialist in the Agriculture Global Practice of the World Bank. Prior to joining the Bank, she was the Senior Adviser for Agriculture and Rural Development in Ministry for Foreign Affairs of Finland. She has dealt with a variety of gender issues in agriculture, food security, rural development and relief operations both at policy and field level while working in the Food and Agriculture Organization of the United Nations (FAO), World Food Programme (WFP) and a private consultant company. Sanna holds a Master’s degree in Agriculture and Forestry from the University of Helsinki. She has also studied tropical agriculture at the Universidad de Costa Rica and horticulture at the Swedish University of Agricultural Sciences.